A well-known travel truism is “When in Rome, do as the Romans do.” If you want to live by this credo while vacationing in Orange Beach, Ala., you should seek advice from your beach chair attendant – especially if they work for Perdido Beach Service. Whether you are looking for a jet ski rental or the best Po Boy sandwich on the beach, they’re the guys to ask. 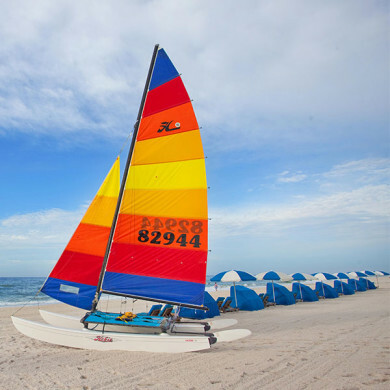 Officially, Perdido Beach Service provides beach equipment rentals including chaise lounges and umbrellas, stand up paddle boards, boogie boards, kayaks and captained Hobies – you may even be able to sweet talk them into some surfing lessons. There’s no need to book in advance. Just have a seat on one of the chairs and they’ll come over and take care of the rest. Owner Ted Scarritt has 30 plus years in the beach services industry. He and his team have served the Perdido Key, Fla., and Orange Beach/Gulf Shores, Ala., for 20 of those years. They consider themselves ambassadors of the region and take pride in showcasing the Gulf Coast’s amazing beaches to the world. Ted’s beach love emerged early. He’s a surfer and a sailor and has always spent his days in the sun and sand. A beach service business was, therefore, a natural fit. He worked in Pensacola Beach for a decade before starting his own company. His business is to rent shade but his passion is building a team that makes customers happy. He says, “The best part of the job is the friendships that have grown with visitors over time, some of whom we have served for decades.” Ted and his team enjoy seeing familiar faces year after year. Guests have their favorite attendants as well, and often request a particular person. There’s a lot that has to go on behind the scenes to maintain such an exceptional level of customer service. During peak times they stock up on additional chairs, closely monitor the weather and help emergency responders by being first on scene for rescues. They even sell sunscreen. Ted has branched out in recent years and expanded his business. Perdido Beach Service also owns and operates a charter cruise company called Sail Wild Hearts. Read more about the cruise on the Sail Wild Hearts website. Visit the Perdido Beach Service website for more information or call (251) 981-4807 for current pricing schedule. To book your sailing adventure, call (251) 981-6700.